Absolutely fabulous trip on the Cataract Express with an awesome guide (Mike). My teenage sons loved the Colorado River experience, wished we could have taken a longer trip! This is a great opportunity to bond as a family and enjoy the wonder of nature - away from the distractions of the electronic age! 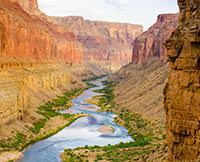 We'll be back for the Colorado River in the Grand Canyon next time!